In PANIC RESTAURANT, you play the role of Cookie, a skilled chef who owns the popular and successful Eaten Restaurant. But when a jealous chef named Ohdove steals the restaurant, you decide to steal it back before your business is ruined. But something very strange is going on inside the Eaten the food and appliances have come to life! Now you must use all your culinary skills and a few kitchen tools and utensils to defeat Ohdove and his mutant minions in order to win back your restaurant. You'll face heinous hot dogs, angry apple slices, and food-flinging frying pans as you make your way through the restaurant in search of Ohdove. 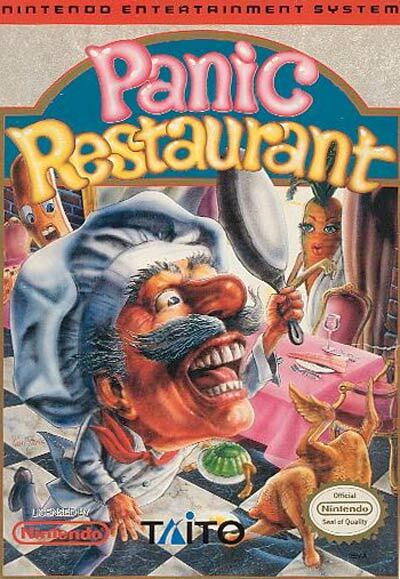 So don your armored apron and get ready for the wildest food fight you've ever seen in PANIC RESTAURANT.